Invasive pulmonary aspergillosis (IPA) is a life-threatening disease that occurs in critically ill patients as well as in immunocompromised individuals. Tracheobronchial aspergillosis (TBA) is a variant of IPA. TBA is associated with solitary invasion of tracheobronchial tree, and most of the times, it imitates bronchopneumonia. Isolation of Aspergillus from tracheobronchial secretion has poor predictive value; thereby, for confirmation of diagnosis, histopathological analysis is performed. Fiberoptic bronchoscopy findings pooled with microbiological analysis of tracheobronchial specimen hasten the diagnosis. Voriconazole is the drug of choice in a patient with IPA. Here, we discuss the case of a 54-year-old female, known case of advanced nonresectable tracheobronchial mucoepidermoid carcinoma, who presented with sudden respiratory distress. She was diagnosed to have TBA and was treated with debulking and voriconazole. She responded well to the treatment. A 54-year-old female, known case of advanced mucoepidermoid carcinoma of the left main bronchus extending into the trachea and descending into the right main bronchus on palliative debulking and chemotherapy, presented with acute respiratory distress. She got admitted with sudden desaturation and cardiovascular collapse. She was intubated in the emergency department. Her routine blood investigations were within normal limits. In view of very poor tidal volumes and inability to ventilate, an urgent bedside fiberoptic bronchoscopy was performed. It revealed complete obstruction of trachea and both main bronchi with fleshy tissue and mucous plug debris/tumor, and debulking was done [Figure 1]. 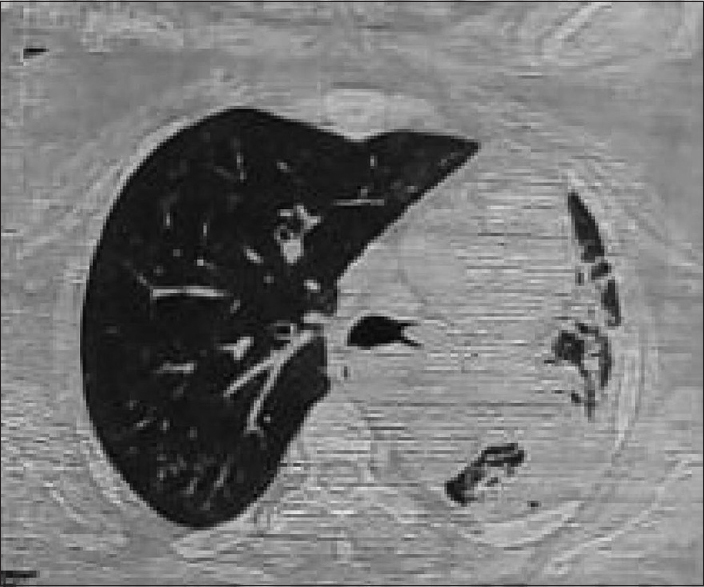 Computed tomography showed Hypermetabolic soft tisue mass in the subcarinal region. No obvious focal hypermetbaolism seen in the intrabronchial region in the left: consolidative changes with air bronchograms and surrounding ground changes are likely to represent post obstructive changes. There is evidence of Left pleural effusion, Left prevascular node with no evidence of contralateral mediastinal adenopathy [Figure 2]. Postbronchoscopy ventilation improved and a check bronchoscopy performed after 24 hours showed only tracheal lesions and non obstructing left main bronchus lesion and patent right main bronchus. She was gradually weaned off and extubated uneventfully after 72 h. Histopathology of the debris revealed Aspergillus fungal filaments [Figure 3]. She was started on voriconazole and was discharged on day 10 in stable condition on oral voriconazole. IPA is a life-threatening disease that occurs in critically ill patients as well as in immunocompromised individuals. TBA is a variant of IPA which is associated with solitary invasion of tracheobronchial tree.,, It was fi rst described in 1991 as invasive Aspergillus tracheobronchitis after lung transplantation. Invasive or potentially invasive Aspergillus airway diseases are seen in three main groups of patients: (1) lung transplant recipients, (2) highly immunocompromised patients with hematologic malignancies and/or patients undergoing hematopoietic stem cell transplantation, and (3) the remaining, less severely immunocompromised patients, or even immunocompetent individuals. Various underlying conditions were diagnosed in patients who developed invasive TBA (ITBA). These include various malignant diseases (e.g., thymoma, breast, lung, esophageal, and renal carcinomas) and chronic diseases, e.g., diabetes mellitus, chronic obstructive pulmonary disease, and posttuberculous tracheal stenosis. It usually presents with features of bronchopneumonia. TBA causes fever, cough, purulent sputum, and hemoptysis with or without parenchymal infiltration. These symptoms and signs may be nonspecific. Our patient was a known case of tracheobronchial mucoepidermoid carcinoma on palliative repeated endoscopic debulking and chemotherapy. She presented with respiratory distress and severe wheeze with insufficient ventilation. Clinical suspicion and bronchoscopy with debulking in emergency setting salvaged her by allowing and ensuring adequate ventilation. As per literature Invasive aspergillosis can be classified based on bronchoscopic findings into four types: Type I, superficial infiltration; Type II, full layer involvement; Type III, Occlusive; and Type IV, mixed. CT scanning, positron emission tomography-CT scanning, and endobronchial ultrasonography can demonstrate bronchial wall involvement with bronchial lumen narrowing in patients of invasive TBA. More importantly, bronchoscopy plays a crucial role in endobronchial disease assessment and specimen collection for microbiological and pathological evaluations. However, it may cause hemorrhage due to friable nature of the disease. Isolation of Aspergillus from tracheobronchial secretion has poor predictive value and hence histopathological diagnosis is mandatory. However, characteristic fiberoptic bronchoscopy findings pooled with microbiological analysis of tracheobronchial specimen obtained during bronchoscopy can hasten the diagnostic process. CT in our patient showed subcarinal heterogeneous enhancing mass lesion invading the left main bronchus abutting the right main bronchus and bilateral pulmonary arteries Bronchoscopy debulking done showed fleshy tissue and mucous plug. Aspergillus fumigatus is the most common pathogen identified in all Aspergillus infections accounting for around 50%–60%. ITBA is a relatively rare manifestation of Aspergillus-related lung disease. Histopathological examination of the specimen retrieved from our patient revealed Aspergillus fungal filaments. Prognosis in immunocompromised hosts is poor with mortality rate going up to 70%. Early diagnosis and initiation of antifungal therapy is important in immunocompromised hosts. Different treatment modalities include amphotericin B, voriconazole, or itraconazole. Voriconazole is the treatment of choice in most patients. The Infectious Diseases Society of America recommended voriconazole as initial therapy in treatment guidelines for IPA including TBA in 2008. Our patient responded to emergency debulking to open the airway followed by intravenous voriconazole. She was discharged on oral voriconazole and is well controlled at 1-month follow-up. We report here a rare case of ITBA in a known case of mucoepidermoid carcinoma of tracheobronchitis. 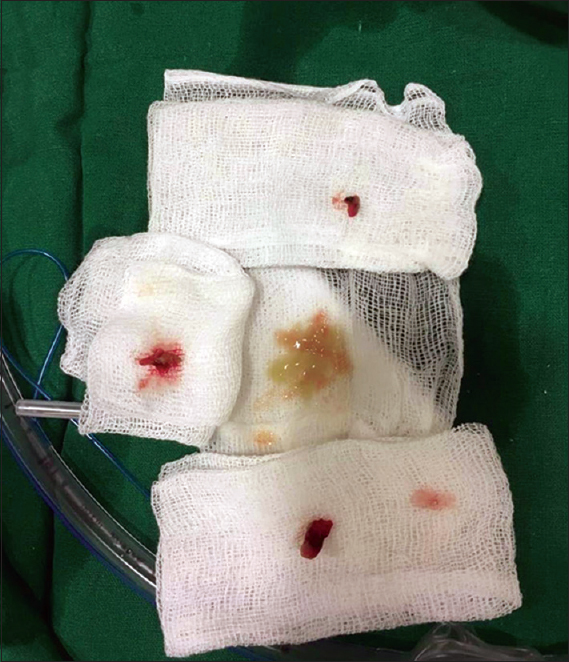 The correct clinical suspicion and timely bronchoscopic intervention followed by voriconazole salvaged the patient in an emergency situation. Thakur LK, Jha KK, Jha S, Jha A. Fulminant tracheobronchial aspergillosis. BMJ Case Rep 2017;2017. pii: bcr2016219127. Krenke R, Grabczak EM. Tracheobronchial manifestations of Aspergillus infections. ScientificWorldJournal 2011;11:2310-29. Lee HY, Kang HH, Kang JY, Kim SK, Lee SH, Chung YY, et al. 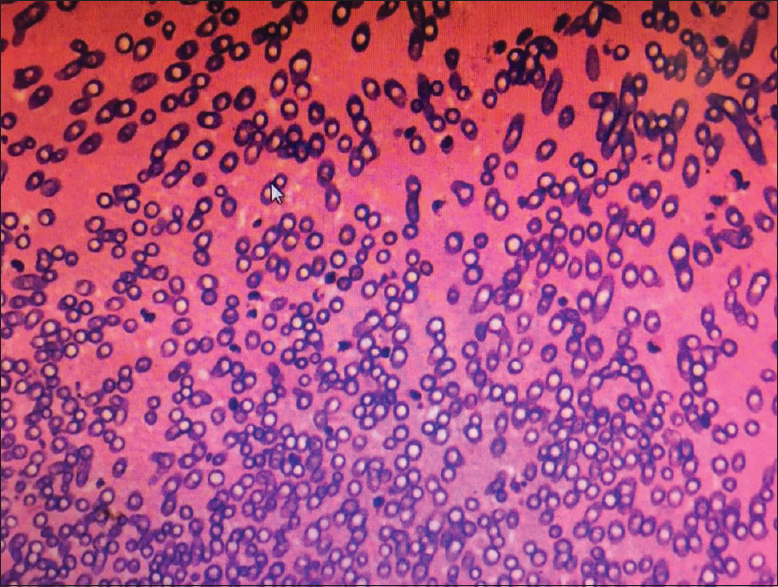 A case of tracheobronchial aspergillosis resolved spontaneously in an immunocompetent host. Tuberc Respir Dis (Seoul) 2012;73:278-81.